After the Exxon Valdez disaster, you had scores of images of ducks and otters slathered in crude. There were pictures of dead whales washed up against gleaming black rocky beaches. It was lurid — and impossible to ignore. By contrast, Brulle points out, not nearly as much oil from the BP accident has reached the shores of the Gulf Coast yet. Even groups like Greenpeace have only been able to rustle up a few pictures of a handful of ducks covered with oil. That’s not the sort of thing that drives TV coverage. 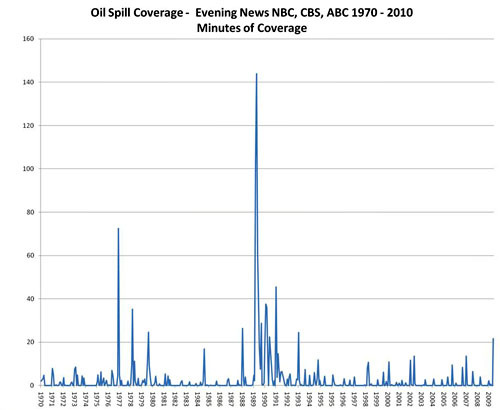 And it may mean that the current spill makes far less of a dent in public opinion than past disasters have. Brad has more over at his place.